Kelly Kester Oahimijie has been a revelation at Sharks FC, the current leaders of the Nigeria Professional Football League. Oahimijie has played 13 of 17 matches so far this season. West African Football is proud to present a short interview of the versatile midfielder. 2) Date of birth, place of birth? 18.06.1994, Edo State (an inland state in western Nigeria). 6 feet 4 inches (193 centimeters), 85 kilos. 5) Preferred position(s) on the field? I’m an all-round midfielder. I can play anywhere in the midfield. My preferred foot is my right foot. 7) How would you describe yourself as a footballer? What are your strengths as a player? I want to be the Yaya Touré kind of player. Strong, energetic and all. I don’t have any national team experience yet, but I’m hoping on playing very soon. 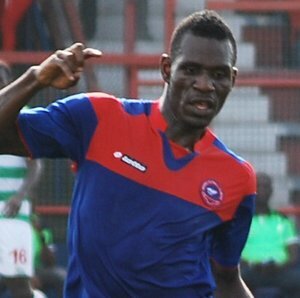 I have played for only one professional football outfit before Sharks FC – FC Abuja in the Nigerian National League. 10) What do you want to achieve as a footballer? I want to play at the highest level, and also represent my country. It would be great if I’m able to help Sharks FC win the Nigeria Professional Football League in my first season at top level. 11) Who are your heroes in football? I gather inspiration from a lot of players that I play similar roles with, like Yaya Touré, John Obi Mikel and Victor Wanyama etc. 12) What is the secret behind Sharks FC’ strong midfield this season? I think the secret is down to our commitment, our understanding and willingness to work for each other. 13) Who do you consider to be the most important players at your club? My skipper Odinga Odinga, Ajani Ibrahim etc. 14) Who do you think is the best player(s) in the local league? I really can’t single out any player as the best in the league because I don’t watch all the games in the Nigeria Professional Football League, but I think we’ve got great players in the league. 15: what are your highlights as a footballer so far in your career? Playing in the Nigeria Professional Football League because it’s always been my dream to play in our local league before seeking for greener pastures abroad. The picture of Kelly Kester Oahimijie was found on SuperSport.